Last week’s big storm has left behind some bumpy reminders on many state highways, including Phoenix-area freeways. Arizona Department of Transportation crews have been busy since the weekend filling potholes and repairing other pavement damage caused by the one-two punch delivered by Mother Nature and traffic. Potholes can pop up quickly when moisture seeps into and below asphalt, which can be stressed by the combination of lower overnight temperatures and daytime thawing, especially at higher elevations. Add in the pounding of traffic, and parts of a highway’s pavement can break away or be worn down. 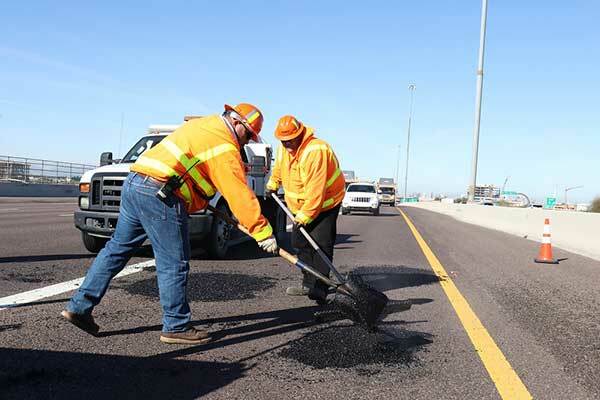 With the Valley’s freeway system affected by last week’s storm and cooler temperatures, the priority for ADOT’s Phoenix-area crews has been to fill larger, deeper potholes as soon as possible. Repairs to areas where the inch-thick top layer of rubberized asphalt has worn away will occur in the coming days and weeks. Much of the patching and more extensive pavement repair work takes place during overnight hours when traffic is lighter. In the state’s high country, the record snow that fell last week in Flagstaff and other areas continues to melt. That can stress pavement, especially when combined with freeze-thaw cycles created by warmer daytime weather and freezing temperatures at night. Flagstaff usually experiences more than 200 daily freeze-thaw cycles each year, creating a challenge for ADOT maintenance crews in that region. When storms create potholes, highway workers make initial temporary repairs as soon as possible with an asphalt mix that is placed in the damaged area and tamped down. More permanent repairs can involve the use of a milling machine to remove a section of pavement around a pothole. Asphalt material is used to fill the hole, before crews finish the repair by using a heavy compaction roller to smooth out the pavement. Drivers who want to pass along pothole or damaged pavement locations on state highways can notify ADOT by visiting the agency’s website at azdot.gov and clicking on “Contact” in the upper right corner of the homepage. The annual cost of pothole and other pavement repairs depends on the severity of a winter season. ADOT usually plans on approximately 10 percent of its winter operations budget being spent on pothole repair on highways in the high country.